A Family Tragedy (and a valuable genealogy lesson learned) | Where's Merrill? Many years ago, when I started researching my Family Tree, I did not have a clue about my grandfather Ned Neary‘s birth family. After some time, I eventually discovered that Ned was the youngest of twelve siblings; there were six boys and six girls. I knew nothing about any of them, except for Ned, and even he was referred to as Edward or Ted in my lifetime. It appears that “Ned” dropped his Irish nickname after leaving County Sligo in the late 1930’s in favour of the more Anglicized abbreviation of his baptismal forename. Ted Neary moved across the Irish Sea to England, and I suppose that the Irish immigrants of the day had to “fit in” and grudgingly accept the monikers which their new neighbours and workmates applied. However, back in Sligo, everyone remembered Ned as Ned, if you get my gist. Anyway – I was not long into my ancestry research project when I set myself the challenge of tracking down each of grandfather Ned’s deceased siblings, and finding out about their lives. Both Ned and my father (Ned’s oldest child) were dead too, so they could not help my quest. When researching the six Neary sisters, my new-found great-aunts, I soon learned that three of these ladies had got married in New York City, and had their own families, thereby introducing me to many second cousins. Three of my new cousins had an interest in their family history, and so they could recall passed-down tales about the three Neary sisters who lived their adult lives in the Bronx, and kept in regular touch with each other as an extended family. There was also mention of a fourth sister who emigrated to NYC in her youth but returned to Ireland broken-hearted when one of her siblings stole away her boyfriend – and married him! This sister was identified to be Bridget, and her return to the homestead led me to more fascinating ancestral tales – but more about this saga will be saved for another day. So, I was left trying to trace the lives of just two Neary girls, amusingly called Annie and Fanny. I was getting nowhere until my oldest “new” cousin advised that there was a vague family lore tale about a Neary sister who died in a house fire in America, aged in her 20’s (he thought). Another cousin added some more detail: this Neary girl used to work as a domestic servant at a big house, somewhere in upstate NY. Which of Ned’s sisters burned to death? Was it Annie or Fanny? If only Ned was still alive to tell me about this “secret” tragedy. Back in Ireland, I set about getting the first and main part of the jigsaw in place. Fanny was the youngest of the Neary sisters, and she appears in the 1911 census of Ireland, living alongside even younger Ned at the family farmstead in Sligo. I had an inkling that Fanny was not our fire victim because she would have had to have emigrated just after 1911 (to have died on American soil) and there was no sign of Fanny boarding or disembarking from a transatlantic ship during the 1910’s. My uncles and aunts (and elderly Sligo neighbours) were not aware of a Fanny Neary, so what happened to Fanny? A long search culminated in the discovery of Fanny’s death record. She died in the old Sligo town Asylum Hospital aged just 24 after contracting a form of TB. Poor Fanny – it seems like no-one could remember her time on this earth almost 100 years later. She is remembered now. The Neary fire victim now had a name – Annie – if the fire story was true. My NY-based cousin Patrick Reilly became fascinated with the “Annie Neary Fire” story as well. As he said (with his legal training), the accidental death of an American would lead to an Inquest, and a house fire resulting in fatalities would be reported in local if not State-wide or national newspapers. 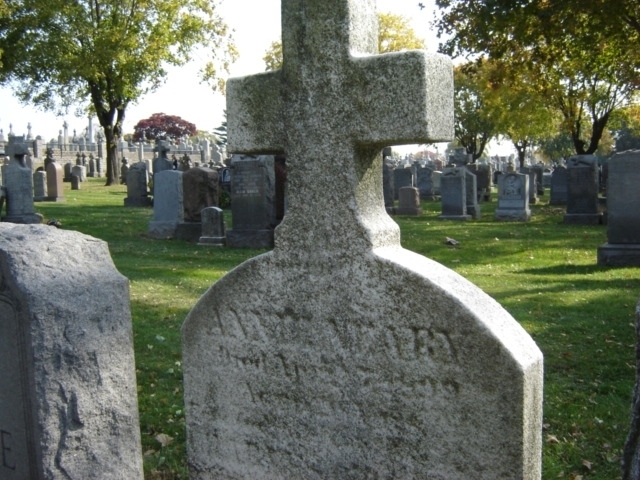 Patrick decided to pay a visit to St Raymond’s cemetery in the Bronx where he knew that Neary and Reilly family graves existed. His hunch proved to be very wise. Patrick came across a weather-beaten old gravestone in the Catholic burial ground, sandwiched between newer grave markers of non-family members, which had been overlooked before. The faint but distinct name of Annie Neary was all that could be clearly deciphered from a long inscription. Patrick attempted to retrieve more data by “stenciling” the remaining characters of Annie’s memorial stone. The month of death was April, but the day and year were less clear. After close scrutiny, Patrick insisted that the date began with a “1” [of course!] and ended with a “9”. The second and third digits also looked like nines, but obviously this could not be. 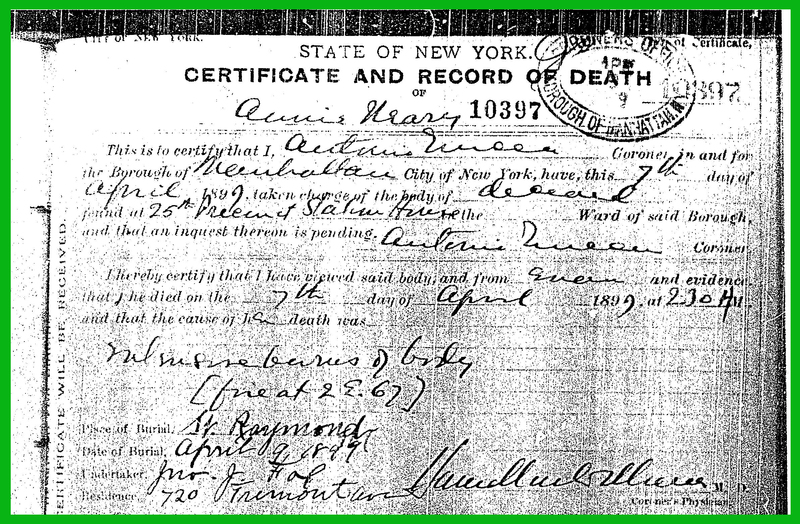 Patrick was aware that his Neary ancestors do not show up in Bronx registers until after 1900, and so a logical conclusion was drawn that Annie must have died in April 1909. We now had a name, a date indicator, and a primary cause of death: FIRE. It couldn’t take much more research to unearth the truth …. could it? Well … two years later, every reasonable research avenue had been investigated without success. Patrick visited Historical Societies and Vital Records Offices in counties to the north of New York City where the wealthier American families once had country retreats serviced by domestic staff. No sign of Annie – and no notable house fires in the first half of 1909. I searched accessible US newspaper archives, from NY and surrounding states. Still no sign of Annie – but (worryingly) a lot of fire fatalities in the papers in the 1900’s decade, and a lot of US history learned along the way. Something was clearly not right. Maybe the dramatic “house fire” story was an over-exaggeration. Maybe Annie did once suffer minor burns, and then contracted an illness, and passed away without any great newsworthy fanfare. We found that there were more than quite a few death certs which met the revised search criteria. Okay – let’s narrow it down to namesake death victims who were teenagers, or aged under 40. That’s better – a handful – and so Patrick ordered the documents for collection from the NY State archives within a few days. My great-aunt Annie, and Ned’s sister, had died in a fire on the night of 7th April 1899. She was aged 21 years. Back in Ireland, Ned was just five years old. We can only imagine the heart-rending grief in the tiny Neary cottage in Tullinaglug, days or weeks later, when the news filtered through. The death cert gave us all the answers we needed. Annie was burnt to a cinder in the attic room of a multi-storey Manhattan home overlooking Central Park in New York City; a room reserved for the servants of the wealthy Andrews family. I am somewhat relieved and grateful that Annie’s employer, Mr Wallace Andrews, repeatedly tried to rescue his domestic staff trapped in their upstairs rooms. These rescue efforts cost him his own life. Annie’s oldest sister Mary was called to the Fire Station House in order to formally identify the charred remains. God knows how this task was completed, technically and emotionally. I was shocked to learn that dramatic fires in the dry timber homes occupied by American city dwellers at the turn of the 20th century were frighteningly commonplace. A fire in one house often spread to a whole block. So what’s the genealogy research lesson? Well, everything, really. A family lore tale says that a relative died in tragic circumstances. First, identify the NAME. What happened? It’s probably based on the truth. Why would anyone make this stuff up. When did it happen? Focus on relative’s ages (at the time) rather than calendar years. If your family suffered a tragedy, say 20 or 30 years ago, you are more likely to say something like “I was aged about 25” rather than “it happened in 1989,” for example. Annie Neary was said to be in her twenties when her life ended in sheer terror and panic, far from home. She was only 21 and this tale got told to her sisters’ young grandchildren, who only half-listened, years after the event. Where did the event happen? The grandchildren retained some memories of the oft-repeated obituary. Annie worked in “big houses” owned by ultra-wealthy NY families. In the summer months, she worked in second homes (mansions) located north of the city, around Westchester County, where the Andrews millionaires liked to escape to a cleaner environment. Not quite “upstate” but “up the State” for an Irish immigrant unfamiliar with American geography. But for most of the year, Annie Neary would be found cleaning out fireplaces and re-lighting fires in the 67th Street town-house of her employer. Annie’s brothers and sisters were very proud of their sibling. She was a much-loved and trusted member of the renowned Andrews [domestic] household. And finally, rely on the eyes of your on-the-ground research colleagues. I was sent a photo of Annie’s tombstone which according to Patrick asserted a date of death ending in 9. I agreed, from long-distance, but I eventually started to question Patrick’s interpretation of the inscription. I put doubt into his mind, which was wrong. This error cost us unnecessary time and expense. We have since learned that Annie was buried in the Bronx in 1899 because she had an uncle (John Stenson) who was settled into this booming Irish neighborhood – but the death year always did end in 9. When the dust had settled, Patrick and I re-visited lessons learned. Why did the clerk with the burial register at the Bronx cemetery never inform us about Annie’s burial in 1899? Answer: …. because we kept saying that she died after 1900, and most likely in 1909. As it happens, when we specified our burial date, the clerk could tell us who else shared the grave and who paid for the burial plot. Priceless (early US) family history information which was almost lost forever. Trust your experienced intuition. You know the family better than anyone. Focus on the facts, and only the facts, however vague and irrelevant they may sometimes seem. Disbelieve what your ancestors recalled at your peril. Keep an open mind, but do not introduce unnecessary doubt. Most of all – stick at it. Answers, or extra clues, can be found in the strangest of places. This entry was posted in Ancestral Tales and tagged ancestry, genealogy, Ireland, Irish Ancestry Research, Neary, Sligo, Stenson by Gearoid O'Neary. Bookmark the permalink.